Now apparently, when investigating the novel feature of a shower in your hotel bidet, the thing is to stand WELL BACK when operating the taps, because what you actually have here is a fountain. Or a geyser, that rivals Pohutu (or Old Faithful) in exuberance. I speak as one who knows. Now. 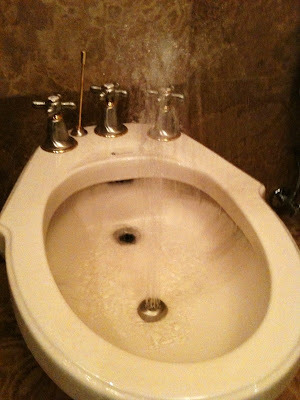 I want a t-shirt that says "Made for a Bidet."